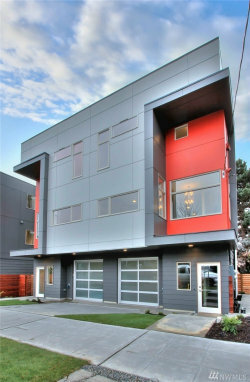 Exciting new modern home by Playhouse Design Group in a popular Ballard location. Waffles in the morning, movies at night and farmers market on weekends. "Smart Home Concept" interactive. Well designed, functional floor plan, with heated cement floors, large windows and nice bright spaces. One bedroom and bath on lower, nice kitchen and living room on the main and two bedrooms, two baths upstairs (one non-conforming - no closet). Great rooftop deck, sunny spot and views. One car garage.